Dig this intensely cool piece of 1990s home video technology I picked up! 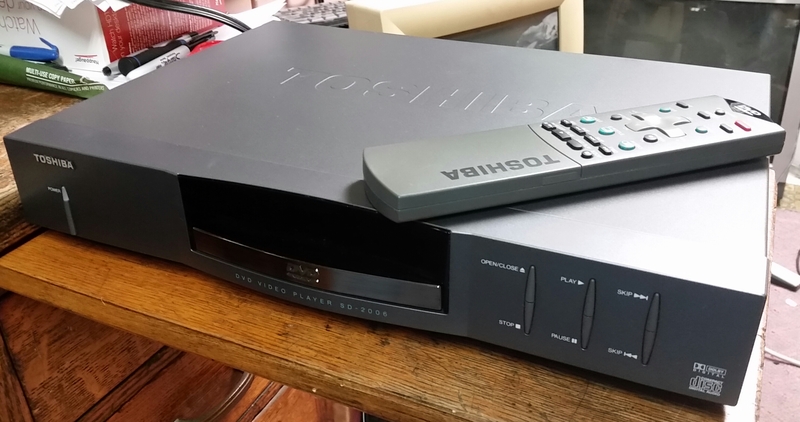 Found recently (at the end of January or start of February) at a somewhat-far-off thrift store, the RCA “Home Theatre” S-VHS VCR (model number VR725HF) came into my life…for only $4. Four bucks?! That’s a great price for a regular VHS VCR, never mind an S-VHS VCR! Needless to say, it became mine. I was initially a bit apprehensive with this one. It was a little grimy, and while I plugged it in and tested it as best I could while there, it didn’t seem to be working quite correctly at first, though this was naturally all “sight unseen.” (I.e., it wasn’t hooked up to a TV.) Eventually it seemed to be running well-enough for me to take a chance on it, and besides, it’s not like I trip over Super VHS while out and about all the time anyway. And so here we are. The final verdict? Read on! As you can better see in this closer-up here, not only was this a 4-Head, Hi-Fi model (as you’d probably expect of an S-VHS), but it was also part of RCA’s “Home Theatre” line. Not “Theater,” “Theatre.” Fancy! Around the late-1980s and up through at least the mid-1990s, RCA really pushed this concept, through swanky TVs, audio equipment, and as advertised on the deck here, even their own satellite receivers. Naturally home video was also part of that equation. This was all a relatively big deal in the 90s, as technology was advancing far enough to where the “home movie experience,” or at least something approximating it, was a progressively feasible goal for consumers. Back then, the better, more-advanced equipment you had, the cooler your living room was. Then again, this was almost-certainly true before and after, too; people always want the biggest and best, after all. This model also has the VCR Plus+ feature. Lotsa VCRs around that time did. What was it? Next to programs listed in TV Guides and whatnot, there was a numerical code. Punch it in on the appropriate VCR menu, and it’d automatically record the show. I never used the feature back then, and I don’t think our VCR at the time even gave it as an option, but it’s a neat concept. This isn’t the first S-VHS deck we’ve seen here in recent months. Astute readers (all two of you) will recall the incredible “prosumer” Panasonic AG-1970 that I wrote about back in September. That thing is a legit beast, and while no one will claim this RCA to be in the same league (it’s decidedly a “consumer” unit, as opposed to a “prosumer” one), it definitely lives up to the “Home Theatre” branding. If nothing else, it’s nicer than the Memorex S-VHS VCR I wrote about years ago. I’ve mentioned before my ambivalent feelings regarding electronics, or more specifically VCRs, from the 1990s. In general, they seemed to become cheaper, flimsier, less-feature-packed, less-reliable than decks from the 1980s. That’s a generality of course, and naturally there were exceptions. Some (okay, many) VCRs from that decade fell into the “affordable” arena, often with plastic casing, 2-Heads, no stereo, etc. etc. etc. My old Zenith is a good example. BUT, some rose above whatever trappings the format had fallen into, be it through slightly more features, higher build quality, or just through a slick-casing. 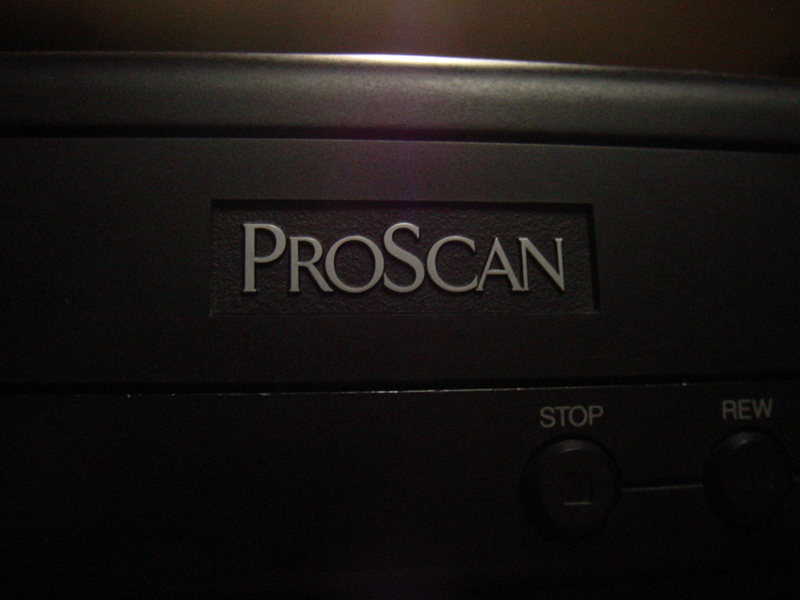 My rad ProScan is a great example. Well, this RCA is undeniably one of those exceptions. You might be tempted to think that all S-VHS VCRs would be exceptions, since they were Super VHS and thus higher-end by definition. That wasn’t necessarily so (I direct you back to the previously-linked Memorex post), but luckily this RCA is one of the good’uns. Though compared to my last S-VHS adventure, you may not think so at first. It doesn’t have a ton of options built into it. Or at least, none that I can see; the original remote was MIA, and hey, maybe there was more that could be accessed there. As it stands here though, you’ve got only standard play-stop-eject-rewind-forward-record-pause options at your fingertips. I can’t even access the much-ballyhooed VCR Plus+ option. Near as I can tell, anyway. Luckily, much of what I can do is accessed through a jog shuttle. I do loves me a jog shuttle, even if it’s usually just for aesthetic reasons. Turn the knob for faster rewinding for fast forwarding, stop for still mode, hit play to get back in action, that’s how this RCA goes about things. Also, there’s, uh, specific buttons for stopping and ejecting, and recording. Speaking of recording, you didn’t have to record in S-VHS; you could use this as a regular ol’ VHS VCR, if you so desired. This is accessed through the little S-VHS button pictured here. The light sez it’s on. Since S-VHS required specific S-VHS tapes, and since regular VHS tapes were far more common, if you wanted to pick up a cheap blank tape at the grocery store, you’d just push the S-VHS button “off,” and then you were good to go! I don’t know if the recording quality for normal VHS would have been any better than usual, but 4-Head Hi-Fi is always a good thing anyway. 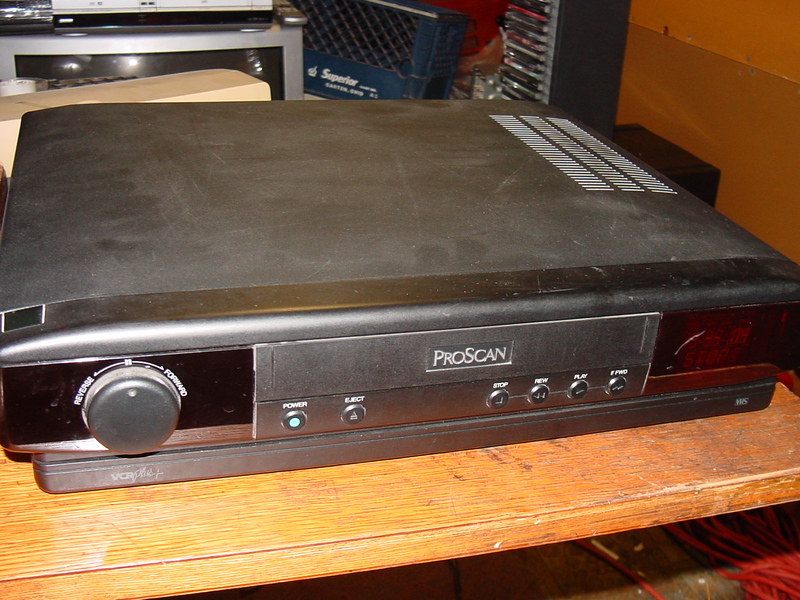 Unlike many mid-1990s VCRs, instead of a cheap plastic casing, the RCA VR725HF is housed in good ol’ metal, and with the black color-scheme, it’s a pretty slick-lookin’ beast. There’s some rounding on the front corners, but it’s mostly slim and boxy, though ridges (?) along the bottom almost give it a foot-stand-like appearance. I don’t know how to describe this, bu I tried to show you in the pic here. I like the looks of this one. It has a heavy duty appearance and feel, yet a clean, elegant design. It almost (almost) comes off as minimalist, but in a good way. I may not go so far as to say it is minimalist, because it compares well to many of the other VCRs of the period in this regard. No, it doesn’t boast a ton of features, at least not on the unit itself, but what’s here is attractive. True to its name, this had to have look derned classy in the home theaters (theatres) of the mid-1990s. Here’s the precious, precious back of the VCR shot you’ve all been clamoring for. I feel like I’m required to include these shots for this to be a full, proper review, but in truth, I never have all that much to say about them. It’s the connections area of the unit, okay? Antenna, AV, and S-Video jacks are all found in abundance. I do like that it has S-Video in and out ports. Also, see, 7-14-1995. Did you think I was lying? I wasn’t. Even though I picked this machine up over a month ago, it wasn’t until this past Wednesday that I dragged it out, cleaned it up, and started fully testing it. You know why it didn’t seem like it was working correctly when I first did preliminary testing upon discovery? Because upon initial start-up, it brings up an option (via blue screen) to scan for channels. Pressing (most) any button will exit out of that, which is why it did seem to start running well shortly afterwards. Or maybe it just hadn’t been used in years and needed time to warm up, I don’t know. Like I said, it was sight unseen. ‘Course, I kinda wanted to see the actual S-VHS stuff in action too, you know? I mean, it handled my old, regular VHS just fine (indeed, phenomenal tracking, picture stabilization and sharpness, even with SLP), but when you’ve got a (relatively) super-charged machine like this, you gotta see it all. Luckily, I had some S-VHS tapes. They were given to me a few years ago, and despite not having a (working) S-VHS VCR right then, it was really only a matter of time. So, I went digging for them, and came up with the 2003 CBS broadcast of Bruce Springsteen’s Barcelona concert. I’ve owned the entire show on DVD for years, but this was recorded in S-VHS SP, so hey, gotta check it out! It looks terrific. Okay, sure, at the end of the day it’s still consumer videotape, it’s not as sharp as a DVD or something, BUT the higher-resolution is immediately noticeable. I mean, just look at Bruce here! The quality is, needless to say, superior to even a regular SP-recorded tape. So, for only $4, I got a real bargain. An RCA S-VHS VCR that appears to work perfectly, and looks cool to boot. I hit up a lot of thrift stores, but things like this just don’t show up everyday, and certainly not at that price. RCA did good work, and that’s evident even now! 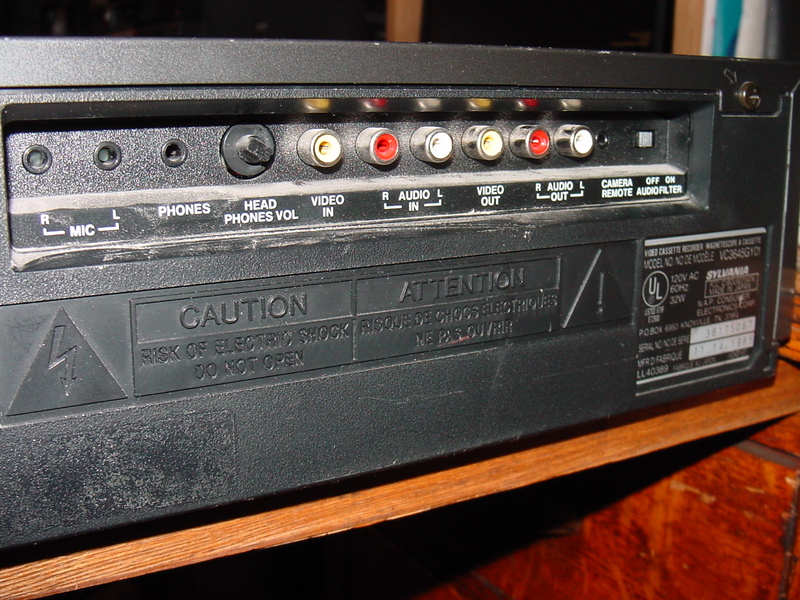 Back in the 1990s, for our home entertainment center, we had an RCA 4-Head Hi-Fi deck. Not an S-VHS, mind you, just normal VHS, but for years it served us well. I eventually ran it into the ground (young tape-head and all), but that was hardly a fault on RCA’s part. 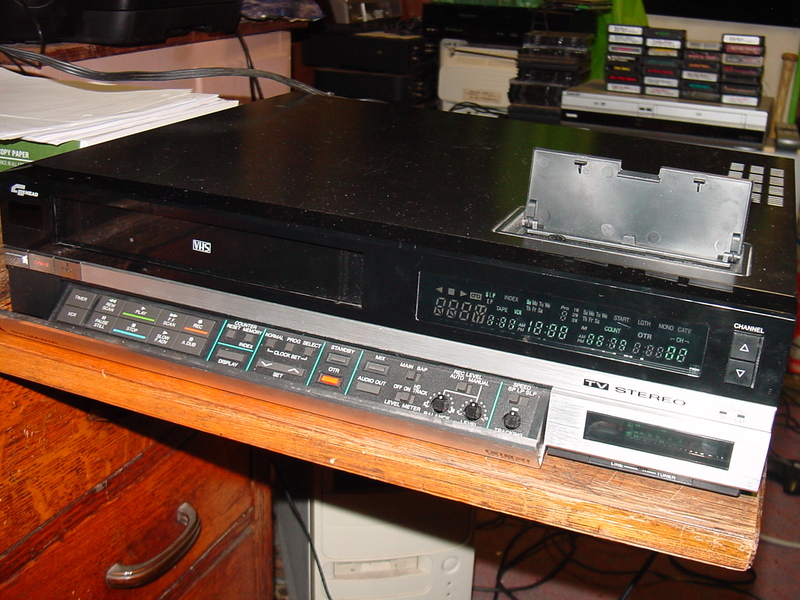 When it comes to 1990s VCRs, it was probably one of the better ones to be had. Dad was big into the entertainment center thing, so that deck coupled, with surround sound, it was definitely cool to watch (and hear!) big budget Hollywood product on that thing. This RCA S-VHS VCR reminds me of that childhood deck, which is totally an added bonus here. All in all, another fine addition to my collection! This entry was posted in Uncategorized and tagged 1990's, 1995, 1995 vcr, electronic, electronics, entertainment center, high end, home video, rca, rca review, rca s-vhs, rca svhs, rca vr725hf, review, s-vhs, s-vhs review, super vhs, svhs, svhs review, vcr, vhs, vhs vcr, vintage, vintage vcr, vr725hf review on March 9, 2018 by neovideohunter. Well, I wasn’t planning on doing another electronics post so soon after the last one, but this is just too cool to not warrant an update. I can’t promise it will be a long update, but an update it will be nonetheless. 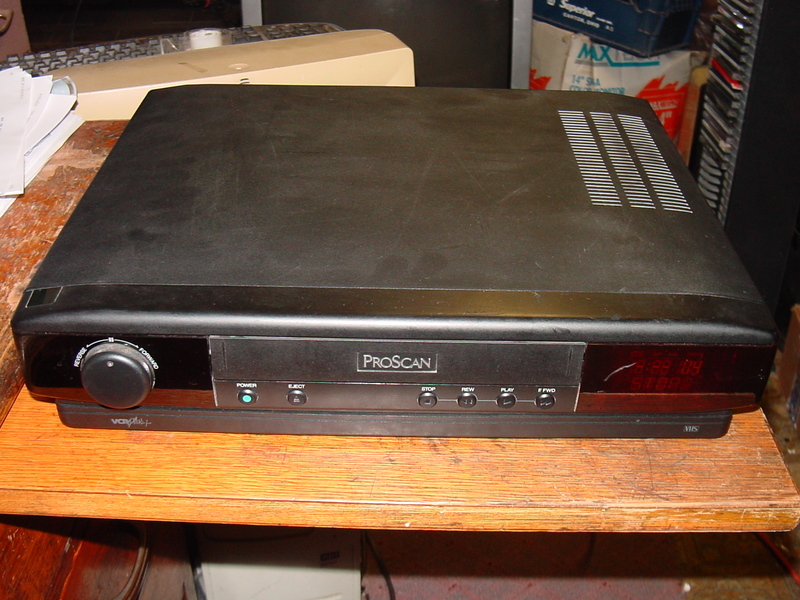 Now at first glance, this may not look all that noteworthy; I mean, it’s a Magnavox 4-Head, Hi-Fi VCR from somewhere in the late-1980s, model number VR2072AT01 – cool, but cool enough to write about? It’s got a fair amount of features, it’s solidly built, and unlike most of the stuff I bring home, it had its original remote included. The fact that the initial testing in the thrift store where I found it seemed to rule out any major problems was just the icing on the cake. At only $5, it was a fine find. And yet, none of that was quite why the machine blew my mind enough to warrant an article. Oh no; look up above and see if you can spot the really interesting aspect. Upon my first coming across this, my eyes were quickly drawn to the door; it had the audio level gauge printed right on it! That’s something I had never seen before, and I was wondering just how such a thing would operate in action. So, I plugged the thing in, grabbed a random tape lying about, and got to testing. My suspicions were confirmed: During playback, the audio levels are actually displayed on the tape door! Now that’s cool! Here’s a closer, albeit lower-resolution (because I left the flash on my phone off and it evidently doesn’t like that), shot of the machine in action. The door feels just thick enough to allow for whatever makes putting the audio levels on it happen, so I hesitate to state they’re actually superimposed on there, but with an actual tape right behind them, that’s sure what they feel like. I did some further token tape testin’ (alliteration) while still at the thrift store, but this was such a neat aspect of the VCR that it was basically already decided it was coming home with me, especially at only $5. It appeared to work perfectly, but by that point that was just gravy for yours truly. No joke, I had never seen something like this on a VCR before, and after purchasing it, you know what? I still haven’t! I figured a quick online search would tell me more about this model, but oddly enough, aside from an expired Craigslist ad and a few scattered mentions of the model number here and there, info on this particular unit was surprisingly scarce. Even the much-loved Vintage VHS Gallery site left me hangin’ in regards to this Magnavox, though I gleaned some other important knowledge regarding their models from the period. Such as: Many, maybe even all, were Panasonic-made VCRs, simply rebadged with the Magnavox name (Panasonic made a bunch of machines for other companies around that time), and they were very solidly-built. I assume same goes for this one. 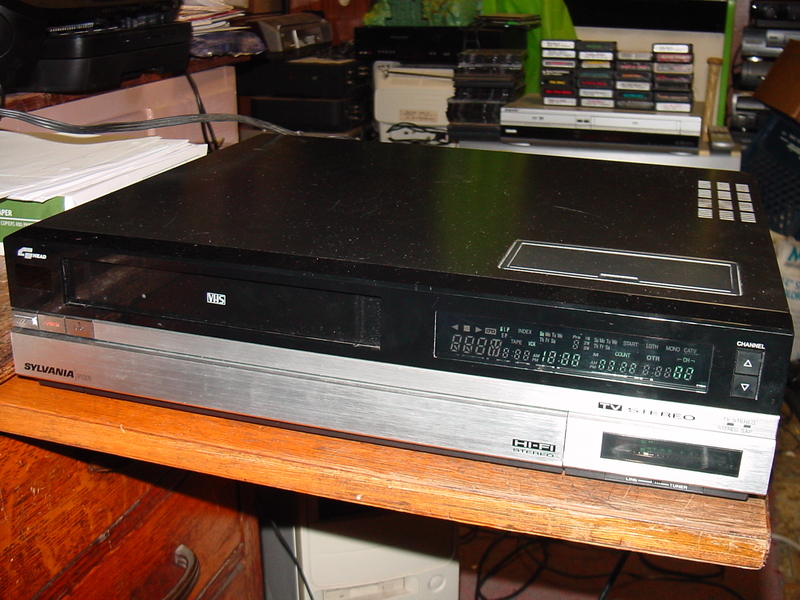 And, while I don’t know if this is the case with this VCR, but some such as this machine only featured a single rubber belt inside, which resulted in units that continue to function well even today. That would account for how well this one currently performs (more on that in a bit), unless unbeknownst to me it had been repaired at some point, of course. Also, these were/are early On-Screen Display VCRs. That is, they brought up a blue-screen that let you program the clock and other functions right from your seat via remote. Also, other pertinent information is displayed on-screen during playback, if the viewer so desired. That’s all something that became incredibly commonplace in the following years, so to see it in its infancy here is pretty interesting. A close-up of the other side of the front panel. The hours-minutes-seconds counter is infinitely preferable to the older-style four-digit counter that was increasingly out-of-date by then. 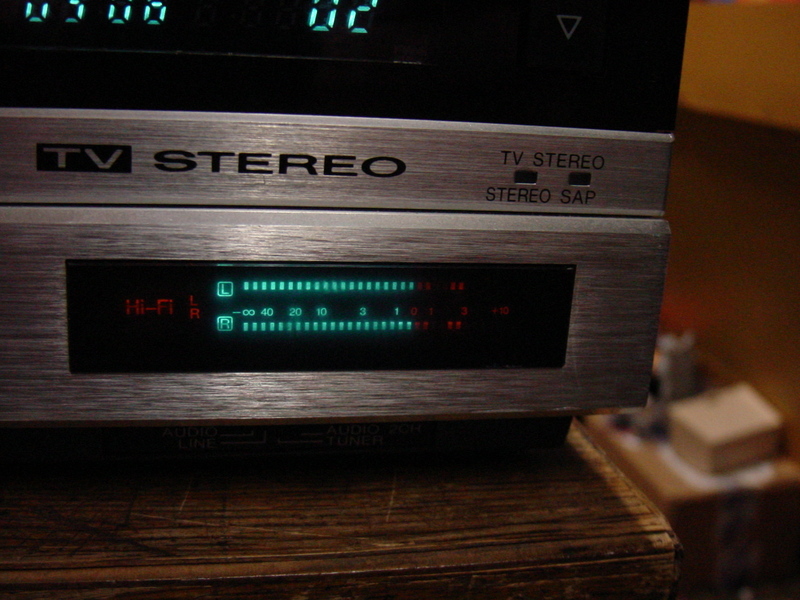 The expected tape-in, recording speed, and audio info indicators are also nice, and the display here remains nicely bright and sharp, which isn’t always the case nowadays. 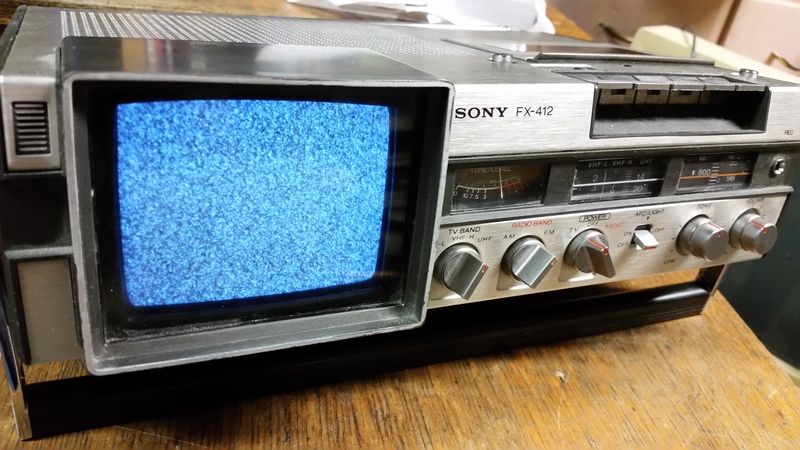 Indeed, I passed up an otherwise-solid Sony from 1995 the other day simply because the display was a bit too dim for my liking; not that I really cared about the display itself, but rather, from how I understand it, that can be an indicator of power supply issues. I ain’t got time for that noise, yo. Button-wise, there’s the typical starts and stops and pauses and what have yous, plus buttons to control the counter and whatnot, which would have been helpful for those that lost their remote (a category I’m not included in – for once). Back in the early-2000s, a relative gave me their old Magnavox VCR. It wasn’t nearly as nice as this one, and a repair job at some point in the past left it without recording capabilities, but it played okay, which was all I cared about with that one. 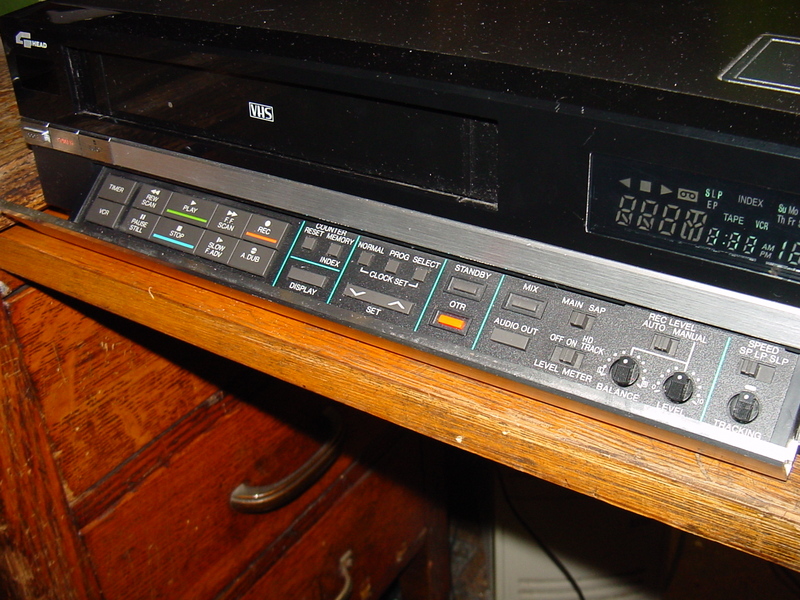 Anyway, it had tiny, hard-plastic, “clicky” buttons just like this VCR, so as it weird as it sounds, these actually do take me back somewhat. Lest you miss it, there’s a flip-down panel too, with even more options to peruse. This of course was even better for those who may not have had their original remote. The buttons to allow for adjustments to the clock and/or recording timer are everlastingly handy, and look at that: An index write feature! Neato! Upon firing the sucker up, you’re presented with the previously-mentioned blue-screen. Sure, there’s the on-screen information regarding playback, Hi-Fi, stuff like that. That’s all well and good, but what I really got a kick out of here was the clock settings. Not so much merely because they’re here, though they’re certainly helpful and hopefully they put an end to the “I can’t get my VCR to stop blinking 12 O’Clock HAW HAW HAW” joke, but rather because of the date featured. 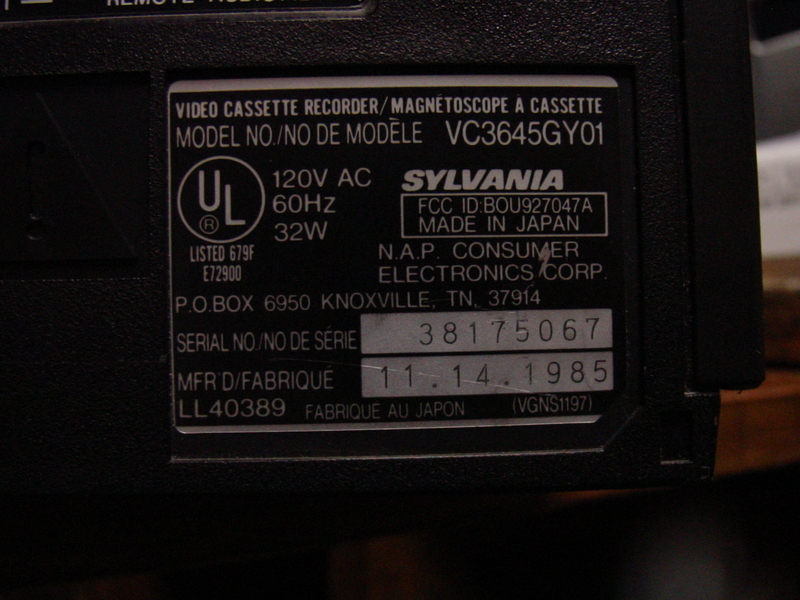 Look, there’s no year listed on this VCR itself, but I did find an online listing for the original manual, and that was dated 1988. 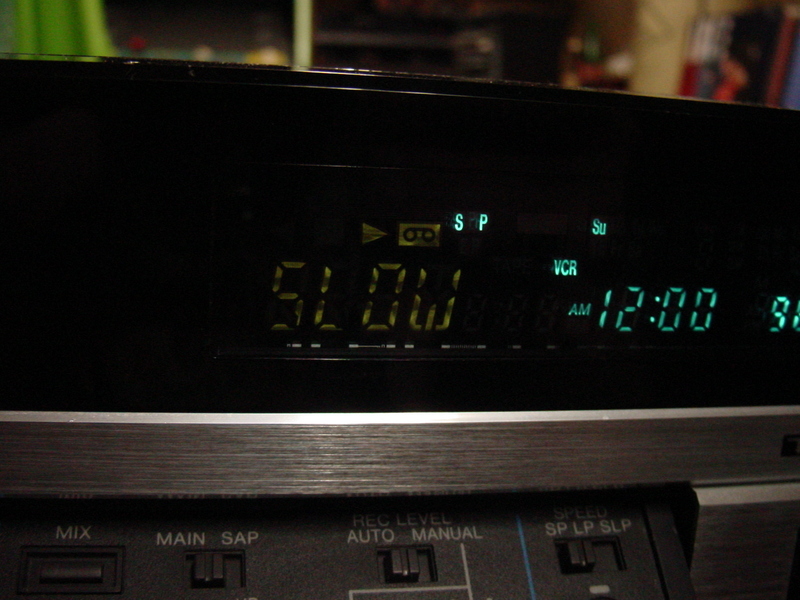 Furthermore, upon trying to set the clock, the default date you’re presented with is January 1st, 1988. So, that’s why the title of the post is notated as “Circa-1988.” I couldn’t find when this particular unit was manufactured, but 1988 or thereabouts seems like a safe guess, right? 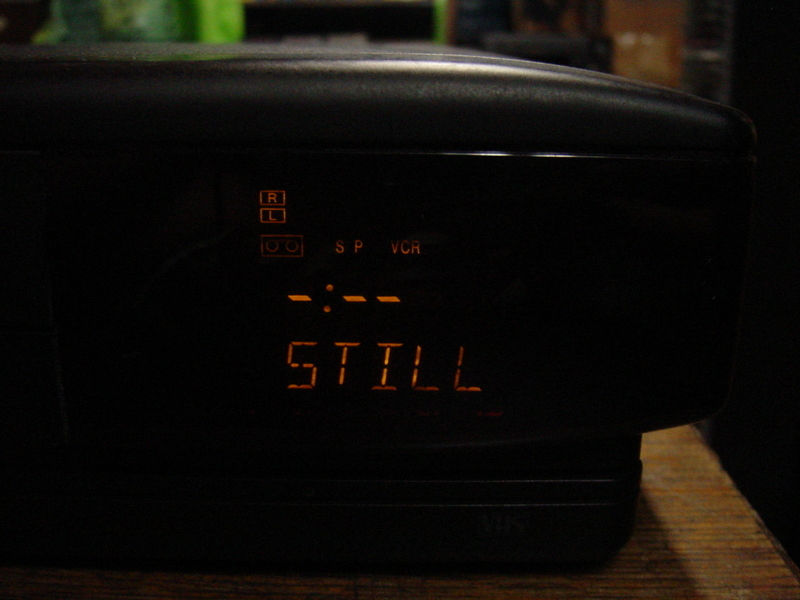 If nothing else, it’s cool to see a small example of the era this VCR hails from (beyond the VCR itself, of course). This was apparently a pretty decent model for the time, and it was around that point that VHS had really taken off into the stratosphere. Machines and tapes were becoming more affordable, and increasingly, VCRs were seen as essential parts of any living room. To me, seeing “1988” on the screen brings all that into sharp focus. As I said, playback here was good, though not perfect. I could happily watched an entire movie on this VCR if needed, but it was showing its age. Some tracking issues, a little jittery, nothing major but still not preferable. What you’re seeing here is a scene from Anchors Aweigh, the lavish Frank Sinatra / Gene Kelly musical put out by MGM in 1945. Hey buddy, Frankie can’t see the X2 info when it’s behind his head! Fun Fact: While a cursory glance at this blog will reveal I’m more into classic horror and sci-fi movies, there’s a part of me that doesn’t mind old school musicals such as this. They’re such a great reminder of a bygone, ostensibly more-innocent age in Hollywood. Plus, they really do tend to be entertaining. I guess I’m not just a horror / sci-fi movie buff, I’m a movie buff period. All that said, when it came time to test this VCR, there were two factors at play: 1) I wanted something big budget, major-studio-released, in SP and Hi-Fi (to better test the capabilities of this machine), and 2) it needed to be something that, should calamity strike and the VCR damaged the tape in some way, I wouldn’t be too irritated by the circumstance. A quick trip to my left, where a big stack of needs-to-be-put-away tapes currently reside, provided me with Anchors Aweigh. And so, here we are. I got a good look at what the VCR can do, and the tape came out of the ordeal no worse for wear. Though, I did discover that while fast-forwarding or rewinding during playback, the picture was pretty jittery. Whether this was an issue of age, the heads, the belt(s), or just how it always was, I couldn’t say. It did what I needed it to, without harming the tape, but it was a cause for concern, though a fairly mild one. Here’s the remote. It’s always nice when one of those are included, though in this case, the only function on it that I’m not seeing on the VCR itself is a button labeled “calendar.” For all I know, that function is accessed through some other way on the unit. I didn’t put batteries in the remote, and thus didn’t test it. Look, it’s nice that’s it’s here, but rarely do I ever need the remote. They’re good to have though. In this case, despite having old batteries still left in it, there was only the tiniest amount of corrosion, which 91% isopropyl alcohol removed nicely. Speaking of alcohol, the remote and VCR itself were both pretty grimy. Indeed, I’m surprised the machine worked as good as it did, given the amount of sticker residue and other, hopefully non-sinister, substances on it. It’s times like that when I bust out the trusty alcohol and give everything a good rub down. I didn’t get the machine or remote spotless, but at least I could afterwards touch both without worrying if I had a bout of dysentery coming my way. There actually wasn’t a whole lot going on with back of the unit; I’m used to seeing countless inputs and outputs and whatnot that, quite frankly, I don’t always know the purpose of. I’m not sure how I feel about this; simplicity is nice, but so is having option upon option. Anyway, here’s the little information plate as seen on the back. See, model number VR2072AT01. Did you think I was lying? I wasn’t. Usually these plates, or at least plates from the era this comes from, feature the date and month that the particular unit was manufactured. Here though, all I get is a bunch of numbers, numbers whose purpose remains a mystery to me. Therefore, “Circa-1988” things shall remain. 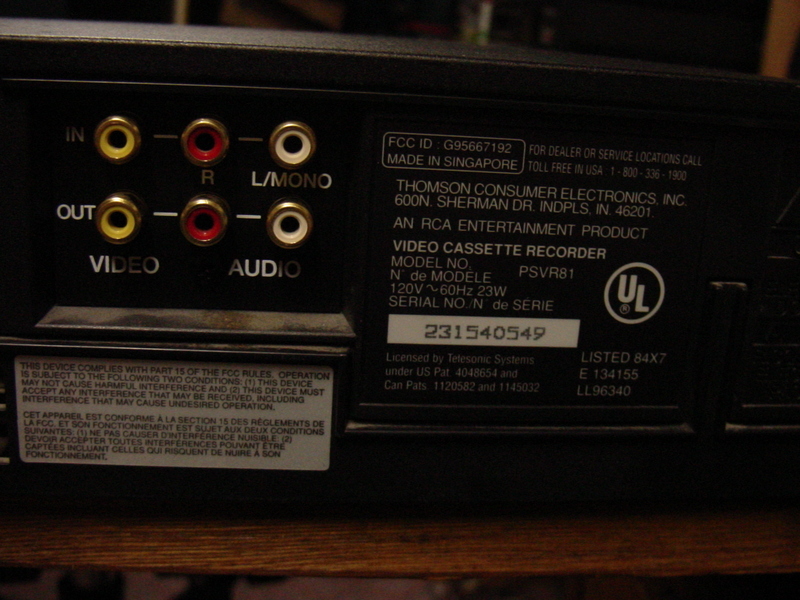 Here are the inputs, such as they are, on the back of the VCR. There’s not much to talk about here; you’ve got red-white-yellow inputs and outputs, as should be expected, a channel selector, and antenna inputs and outputs. 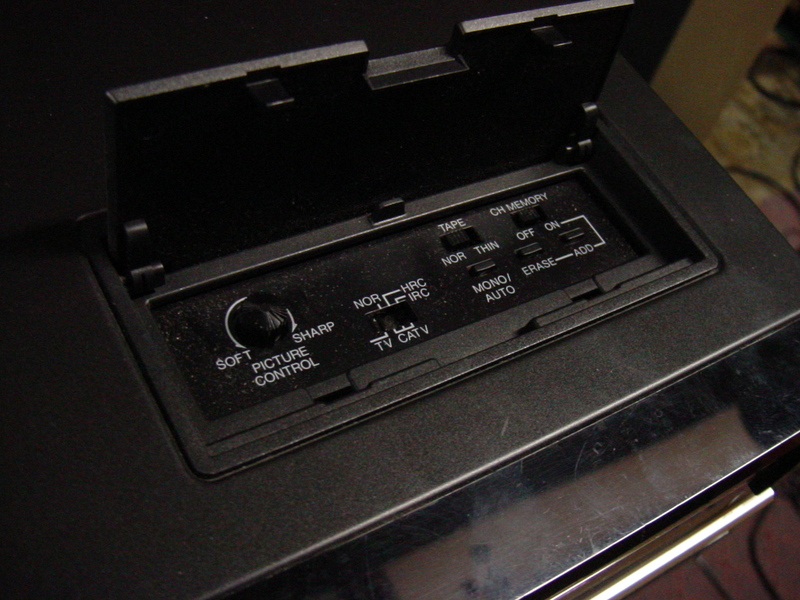 This Panasonic VCR, from 1985, had more options around the back, including what continues to be a somewhat-mysterious Pay TV-knob, and as such, this Magnavox comes off a little barren in comparison. I mean, it doesn’t really matter; the bare necessities are here, and it’s not not like there weren’t plenty of options around front – plus, that whole mega-cool audio-levels-on-the-door thing. After that, do you really need anything else? I posit that you do not. The only thing present on the back of that Panasonic that I especially wish this VCR had its own version of? Something indicating when it was manufactured, man! 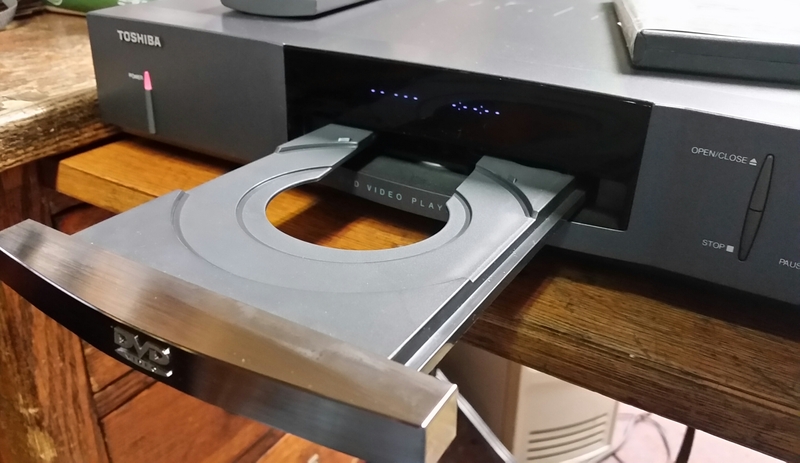 Oh, I forgot to point out that this VCR has classy-lookin’ feet. Look up above. It’s got feet. You can’t deny it. Still, it’s those audio levels on the tape door that I keep coming back to; it’s a feature that would almost seem superfluous, except given all that this unit has, isn’t. I mean, where else could they have put them?! It’s a extra, almost “futuristic” touch that gives this model an added layer of coolness. I can’t say I would have picked this up had it not been here, honestly. Look, the last thing I need is another ancient VCR added to my stack of other ancient VCRs, but I dare say this one was worth the addition. What say you, the reader? This entry was posted in Uncategorized and tagged 1980's, 1988, eighties, electronic, electronic review, electronics, futuristic, hi-fi vcr, hifi vcr, high tech, maganvox hi-fi vhs vcr, magnavox, magnavox vcr, magnavox vhs vcr, magnavox VR2072AT01, model VR2072AT01, old, overview, Panasonic, review, stereo, stereo vcr, summary, technology, vcr, vhs, vhs vcr, video cassette recorder, vintage, vintage magnavox vcr, vintage technology, VR2072AT01 on August 9, 2017 by neovideohunter. 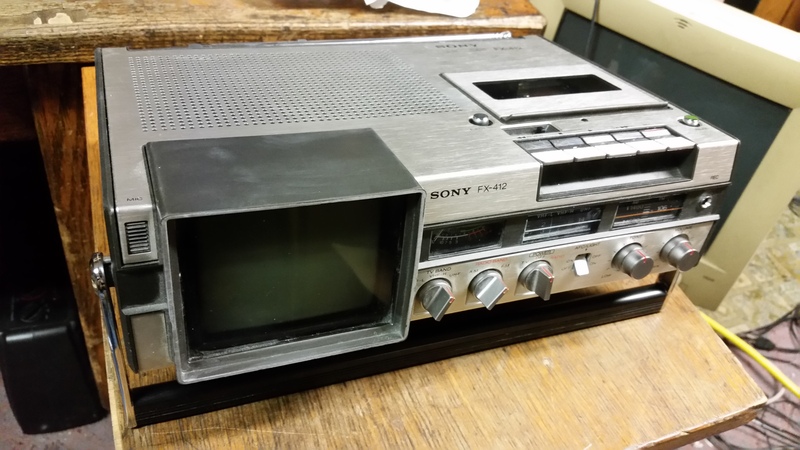 Hey, remember when I used to occasionally look at old electronics here at the blog? No?! I don’t blame you; it’s been approximately 97 years since we last saw a post like this. Mostly, it’s been because I just haven’t found any really worth writing about. That’s not to say I haven’t picked up some neat old VCRs and whatnot while out and about, there have been a few decent purchases, but nothing that would get me sufficiently fired up enough to babble about them for the duration of a post. Simply put, my thrift visits as of late have included the customary electronic searches, but they’ve almost all be fruitless affairs. But then, this happened, and it made all the wasted efforts totally worth it. A recent visit to the Village Discount Outlet thrift on Waterloo Road found your Northeast Ohio Video Hunter, from a cool winnins-standpoint, more or less striking out yet again, until I finally decided to take a closer look at the DVD player that had been continuously staring at me from the electronics shelf. This proved to be one of the wiser decisions I’ve made, as the ensuing revelation of just what this was not only turned my electronics-fortunes around in one fell swoop, but also caused me to babble like a veritable maniac. “Yo, what’s the big deal about a DVD player bro?” It’s not just a DVD player, fictitious example of a tool. Okay, maybe on the surface it is, but that’s not really the point. No no, this is a Toshiba SD-2006, and the historical aspects of it outweigh any of the things it actually, uh, does. Why’s that? 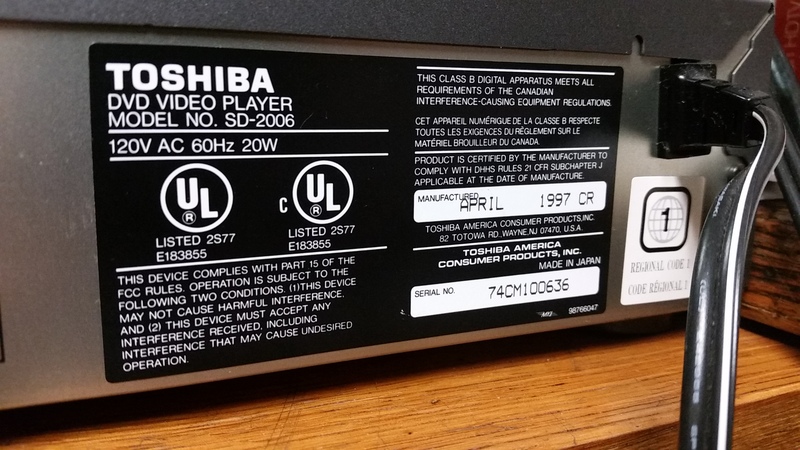 Besides the stamping of April 1997 on the back, which is way early for a DVD player anyway, this site tells me that this was one of two models Toshiba released at the same time on March 19, 1997. 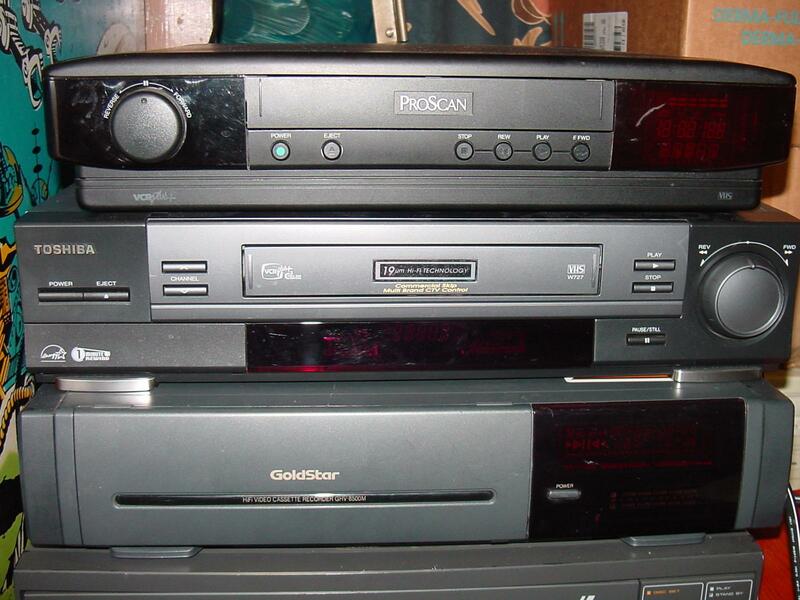 Oh, and those also happened to be the first two DVD players ever released in the US. THAT’S why this is cool winnins. And it still powers up! When I realized just how special this machine was at the thrift store (due in part to a quick online search via my cellphone; thanks technology! ), there was already a better-than-good chance it was coming home with me. But, I still had to go through the usual mental checkpoints before I could plop it down at the check-out counter, even if said mental checkpoints were mostly a formality this time around. 1) Was it in good condition? Definitely, exponentially so. Even had the remote with it! 2) Did it function? I plugged it in and did as much testing as I reasonably could, and the prognosis was positive. Just lookit that cute lil’ disc-tray in action up there! 3) Was the price right? At $15, which is about $10 more than *I* like to pay for any old electronic found at a thrift store, not really. But you know what? Screw it. You only go around once, and this was such a cool piece of 1990s technology, I just couldn’t resist. It didn’t hurt that I had been wanting an early DVD model for my collection, and frankly, it doesn’t get much earlier than this. 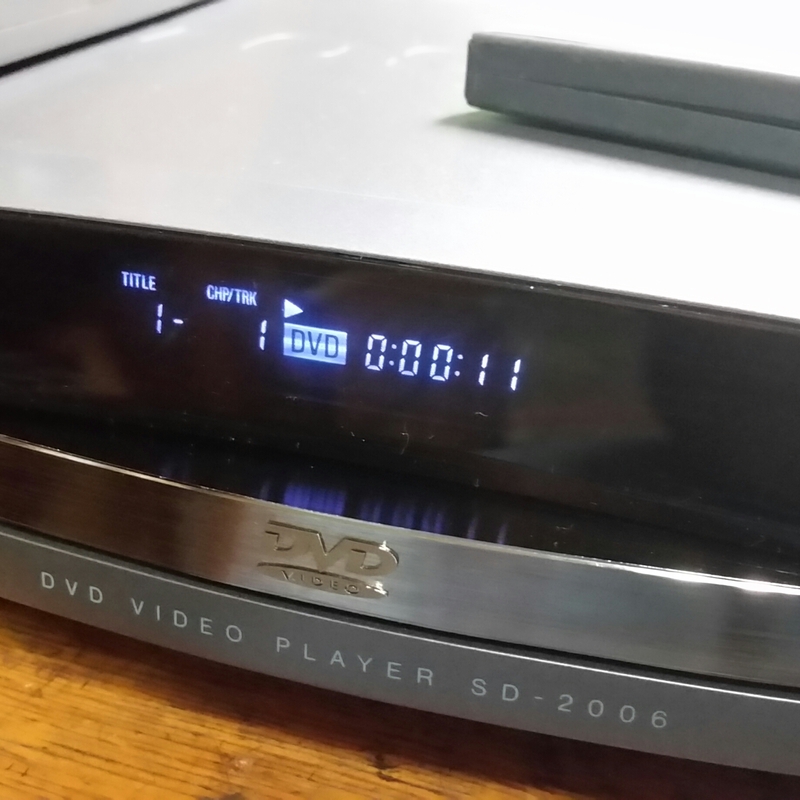 I think that’s why I eventually made a real examination of this SD-2006; it just didn’t doesn’t look like the common, garden-variety DVD device we’ve become accustomed to over the years. There’s a sleek, streamlined, late-1990s sensibility to the casing; it actually reminds me of some VHS VCRs from around that period. I’m not sure it’s a look that could have lasted in the mainstream much longer than it did, but for the home entertainment centers of 1997, it’s perfect. 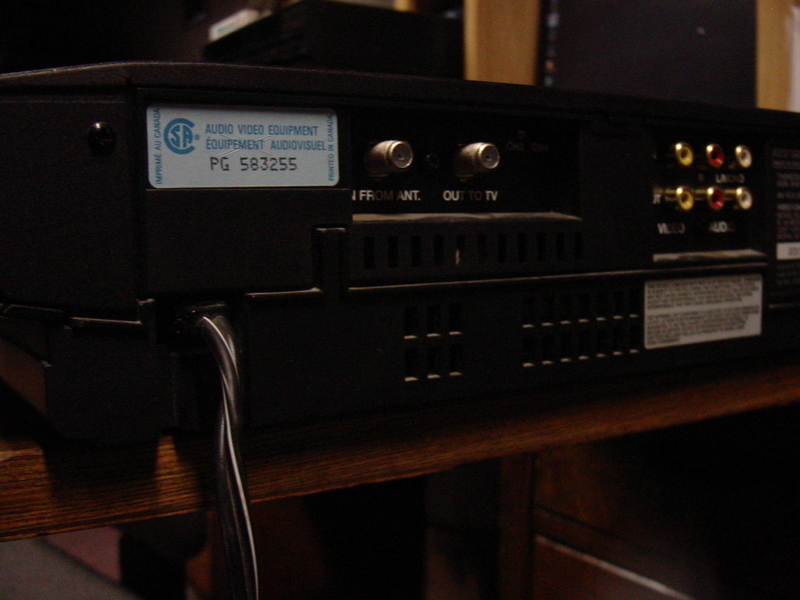 According to that previously-linked site, the two models Toshiba released that day were this SD-2006, and the SD-3006. 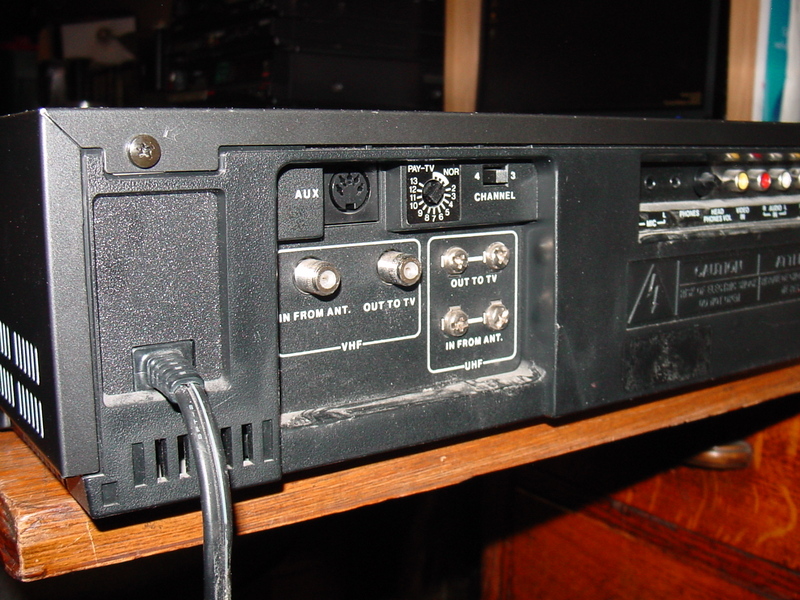 From how I understand it (and a quick online image search bears this out), they were both identical except the SD-3006 had more outputs and whatnot along the back. There was apparently a $100 price-difference between the two because of this. Considering I can go to the grocery store and get a new DVD player for like $20 nowadays (albeit probably not a good DVD player), to look back at when this was the innovation in home video, and a pricey one at that, it’s astounding. 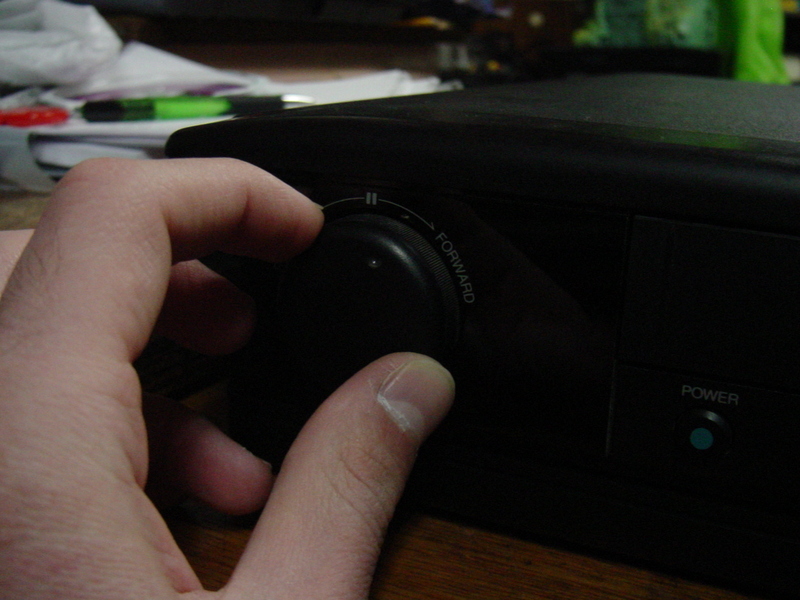 DVD players are everywhere today, but, nearly two decades ago, this was the living end, man. Can you dig it? Has it really been almost 20 years since DVD hit the US? I refuse to believe it’s been almost 20 years since DVD hit the US. See, April 1997. Did you think I was lying? I wasn’t. Before I busted out the cellphone and discovered the true historical aspects of this model, all I knew was that April 1997 was pretty early in the DVD-era. I had the vague notion in my head that DVD was around in the US in 1996, though obviously I was incorrect there. Nevertheless, when I investigated the fine print on the back and saw the date it was manufactured, my eyes popped figuratively (literally?) out of my head. Prior to finding this, I really had been on the hunt for an earlier DVD player. There was no practical reason for this beyond a fondness for vintage (can 1997 now be considered “vintage?”) electronics. 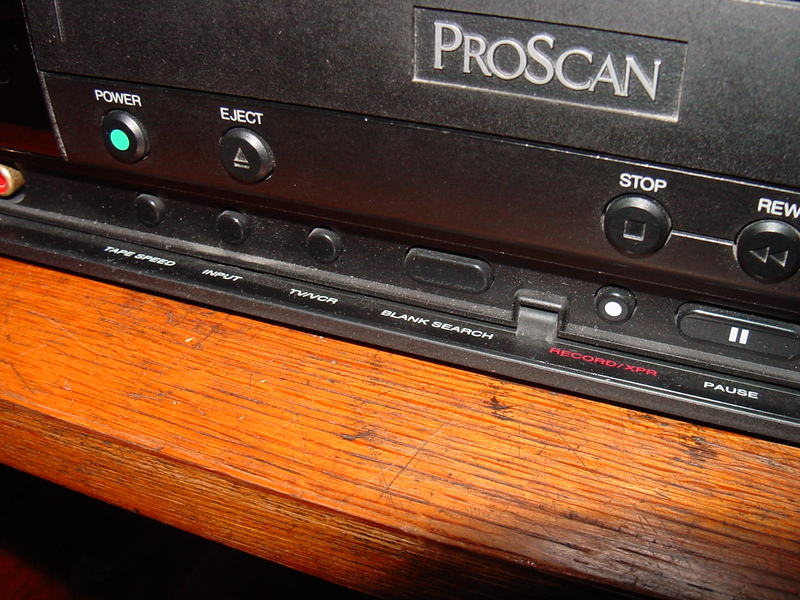 In the months preceding the find, I did buy a cool five-disc RCA player, dated 2000. It worked fine, and it looked classy, but it didn’t quite satisfy the hunger, and I was doing nothing with it, so I eventually donated it to Time Traveler Records. But more importantly, this model symbolizes the almost-mythical aura higher-end video formats such as this held for me at the time (and it’s important to emphasize that this was strictly my personal viewpoint). Keep in mind, I was only about 11 years old when this player was manufactured. I was already an avid tape collector, which made sense, because VHS was basically it. Oh sure, there were Laserdiscs, but in my eyes they were just some vague high-end format Leonard Maltin mentioned in his guides and that filled the first few rows of Best Buy’s movie section; no one I knew had a Laserdisc player. And that early in the game, no one I knew had DVD, either. Certainly not that I can recall, anyway. In fact, until it really took off, DVD was just something that was “in the background” to me; something that was advertised, something for sale at the store, but not something anyone I knew actually had. My admittedly-garbled point is, or was, that VHS was so predominant and the format everyone had, that everything else was kind of ‘obscure’ in my eyes, for lack of a better descriptive term. It wasn’t until the early-2000s when DVD began dethroning VHS that I really started paying attention to it. So, to find a DVD player manufactured when VHS was still king and would continue to be for a few more years, I find that wildly interesting. 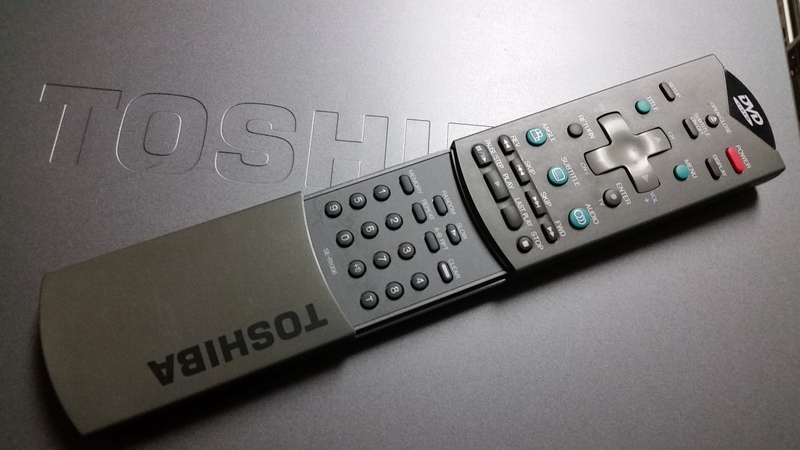 Unlike the vast majority of the old electronics that enter my collection, the SD-2006 came with the original remote! And bonus, it wasn’t so grimy that I’d have to wear a hazmat suit just to look at it! Nice surprisins! For the life of me I can’t figure out where the batteries go, but there’s apparently some still in there, because the player responds whenever I bash on the remote with my meaty paws. 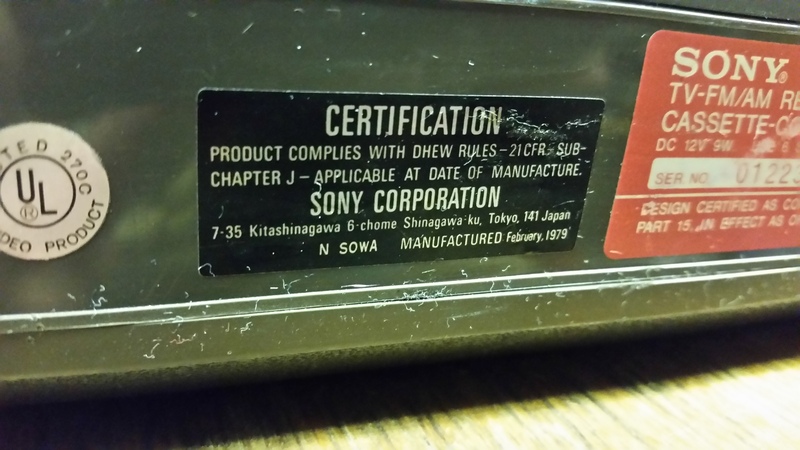 Also, dig the cool “Toshiba” branding stamped on the top of the casing. Sign o’ quality, man. So, the thing was in good cosmetic shape, and powered up, but that doesn’t mean much if it won’t actually play a disc. Because this was more of a collector piece than anything for me, if it didn’t play correctly, I wasn’t gonna be too irked. I’ve got approximately 6000 devices that will run a DVD if need be; I’m pretty sure my toaster will even load one if I ask it nicely enough. Still, it’s obviously preferable that my SD-2006, you know, works. Someday, when I have far too much money (and even more time) on my hands, I imagine I’ll put together a “1990s entertainment center,” which will spotlight electronics from the decade. An appropriate TV, VCR, Laserdisc player, and even a Betamax (I do have the last US model from 1993, baby! ), and perhaps even a video game console or two will round out the set-up. This, of course, would serve no other purpose than for me to be as arbitrarily pretentious as humanly possible, but it’s a thought that amuses me nonetheless. I envision similar set-ups for 1970s and 1980s electronics, as well. 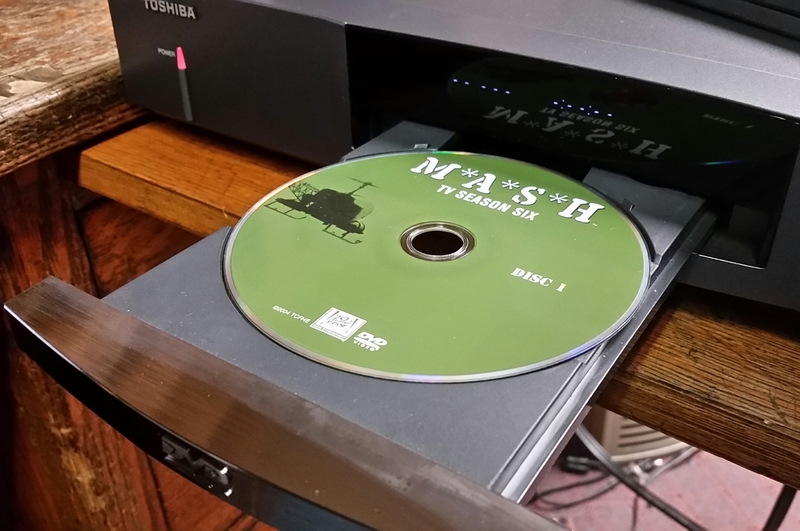 Anyway, when I brought the player down here to take pictures and do further testing, mere feet away loomed my spare copy of the M*A*S*H Season Six DVD set. I have DVDs more from the “era” this model was manufactured, but I wanted to test with something that might pose more of a ‘challenge’ to the player; conventional DVD wisdom is (or was) that some older models had problems with newer discs, specifically dual-layered discs, which this M*A*S*H set is. Season Six was released on DVD initially in 2004, and this was the repackaged version from 2008. So, all kinds of new (newer) DVD to put the player through the paces. Plus, M*A*S*H was within arm’s reach. Also, doesn’t Season Six, Disc One look cute residing in the tray up there? Maybe I wanted to write this article merely as an excuse to use that pic, you don’t know. Well, it certainly appears to be reading something! 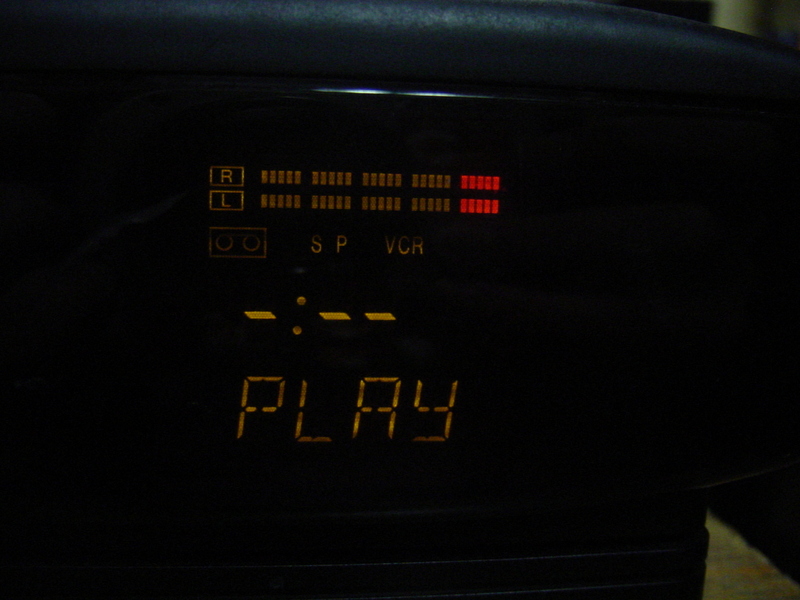 There are no real graphics to be seen upon firing up the player and loading a disc; you get a blue screen and declarations of no disc, loading, and so on and so on. What, you need fireworks? The promise of crystal clear digital video isn’t enough for you? DVD came to improve your viewing experience, and you return the favor by spitting in its face. Real nice, you analog barbarian. I’m not sure if it’s because this thing has been well-used, or simply because it’s such an early example of the format, but it seemed to me that it took a bit longer to load the the disc than what would be acceptable nowadays. Or maybe my perception is just skewed and the load time was perfectly reasonable. I tested this through the video capture card on my PC, and there is a slight delay between what I input and what appears on-screen, so I don’t know. Not that I really care; it’s not like I’m pressed for time when sitting down to watch a DVD anyway, and I’d totally expect an older device to take a bit longer loading a disc. I’m not criticizing here, merely observing. It lives! And it looks really, really nice. I’m not sure what I was expecting, honestly, but the picture was nice, stable and sharp. ‘Course, this isn’t a VHS VCR, so perhaps a dull surprise there. Still, unless you were expecting Blu-ray quality, for a device that’s nearly 20 years old, picture-wise it’s still quite passable. I didn’t play a ton of M*A*S*H, but for what I did see, there wasn’t any skipping or freezing. That’s not to say there wouldn’t have been some later on, had I kept going, or that a cheaper disc would play flawlessly too. But as of now, no problems to report. Above, you can see not only the picture-quality, but also the incredible subtitles-feature in action, as well as the info display. Update your diaries accordingly. I’m furious multi-angle isn’t present. I doubt the SD-2006 is a particularly rare or sought-after model. I’d guess when newer, more feature-packed players began coming out shortly thereafter, the prices for these steadily decreased. Today, it’s probably not worth much more than the $15 Village Discount had on it, if even that. Still, it’s such a cool historical piece, and the date of April 1997 on the back only enhances that. This represents the dawn of the digital video age in the US as we now know it. Is it wildly outdated now? Well, sure; that’s just the nature of technology. That doesn’t bother me in the least, though. I mean, this entire blog is about obsolete TV and TV-related things, after all. Now that I think about it, this may be the most advanced electronic we’ve seen here. It takes a lot to get me excited over an old DVD player; they’re a dime-a-dozen, and I come across so many of them while out thrifting that I barely notice them anymore. Needless to say, I’m glad I noticed this one. 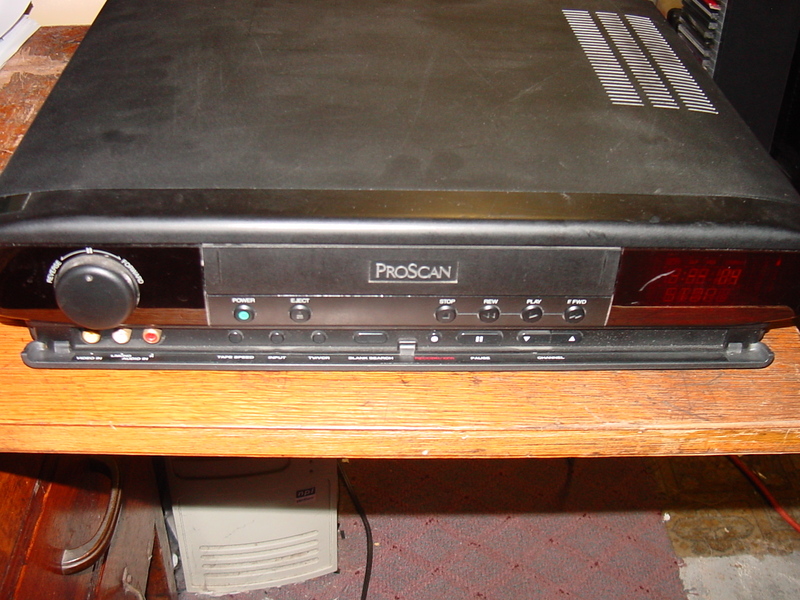 This entry was posted in Uncategorized and tagged 1990's, 1997, 1997 dvd player, 1st dvd, 1st dvd player, april, april 1997, article, batman & robin, early dvd, early dvd player, electronic, electronics, first dvd, first dvd player, first us dvd, old, overview, post, review, sd-2006, sd-3006, Toshiba, toshiba dvd, toshiba dvd player, toshiba sd-2006, toshiba sd-3006, us dvd player, vintage on June 30, 2016 by neovideohunter. Look, y’all know I loves me some portable TVs. I’ve babbled about them before, and I’m about to babble about them yet again. When it comes to old electronics, these specimens are a severe weakness of mine. If I’m at some thrift shop somewhere, and one of these ancient wonders of ostensible convenience happens to be in the vicinity, there’s a better-than-good chance it’s coming home with me (provided it’s priced at somewhere around reasonable, because even I have my limits). I love portable/handheld/whatever TVs. In this regard, fate has been good to me as of late. Little itty bitty Panasonic Travelvision from 1982? Became mine for $5 at a thrift store. A new-in-the-box Realistic handheld TV from 1989? Also became mine for $5, this time at a yard sale (I was gonna buy it anyway, but I felt especially obligated after using the box to smack away an attacking bumblebee that was intent on killing me for no reason). And just last week, I found an ’89 Sony Mega Watchman for $4, and even with a bit-too-corroded battery compartment, I still couldn’t resist. 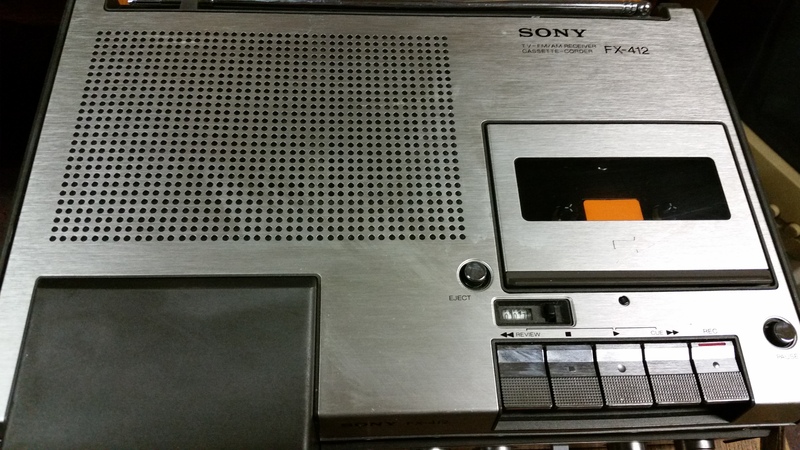 But when it comes to sheer coolness, none of those can compare to this beast of a machine: the Sony FX-412! It’s a TV! 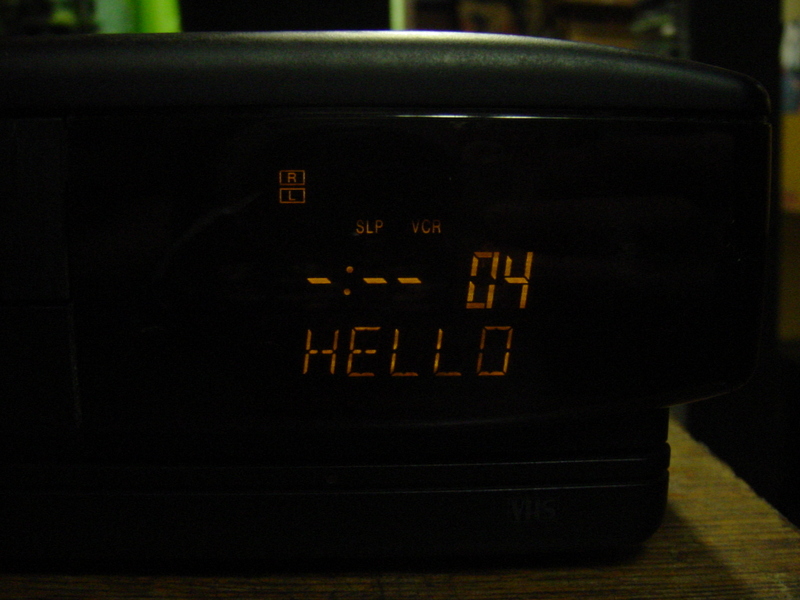 It’s an AM/FM radio! It’s a cassette player and recorder! And it’s from February 1979! 36 gol derned years old! And how much did it set me back? Three big bucks, that’s how much! Cool winnins! The design of the unit is decidedly heavy-duty, and despite the early-1979 date on it (which obviously means it’s 1978 technology, at least), I initially mistook it for something from the 1980s. Given the look and size of the machine, I could easily see it being released as-is in 1983/1984 and not seeming too out of place. It’s certainly a bulky fella, and it’s made all the more unwieldy with a big carrying-handle that doubles as a stand, but given all that it does, it’s really not too far off, size-wise, from similar units that would be released in the following decade. It’s big, but not unacceptably huge. Perfect for camping, bedroom desks, or a shelf in the garage. And that silver finish? I don’t care what anyone says, it still looks darn classy! I have no idea how much the FX-412 cost originally, but given the number of features, portable size, and solid construction, I’m guessing it probably wasn’t cheap. On the back: a jack for an external antenna, plus knobs for the vertical hold, brightness, and whatnot. This is all to be expected. I was hoping for an RF input, so I could hook up my Atari 7800 and play Double Dragon on it, if for no other reason than it would make a sweet post-closing-picture, but no go. There’s probably a way to get it running via the external antenna jack, but I’m not feeling adventurous enough today to even try figuring that out. See, manufactured in February 1979. Did you think I was lying? I wasn’t. My pictures may say otherwise, but this is actually a pretty clean unit. The lint is just leftover from what I used to give the FX-412 a quick wipe down. The super high-resolution of my cellphone camera actually makes things look worse than they really are. To the naked eye, this is a nice-lookin’ machine! 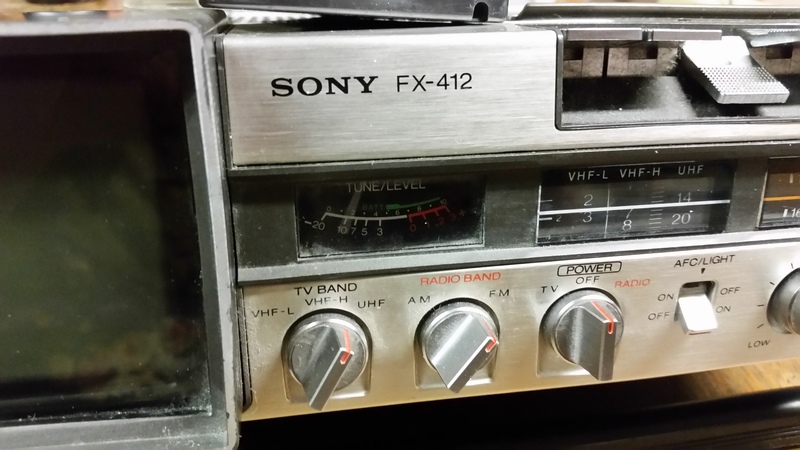 Aside from the expected scratches and whatnot that come with age, the FX-412 is really in pretty good condition. The only exceptions? Part of the antenna has been lost to time, and the AFC/LIGHT switch appears to be broken. Not ideal, but I can live with it, especially for only $3. 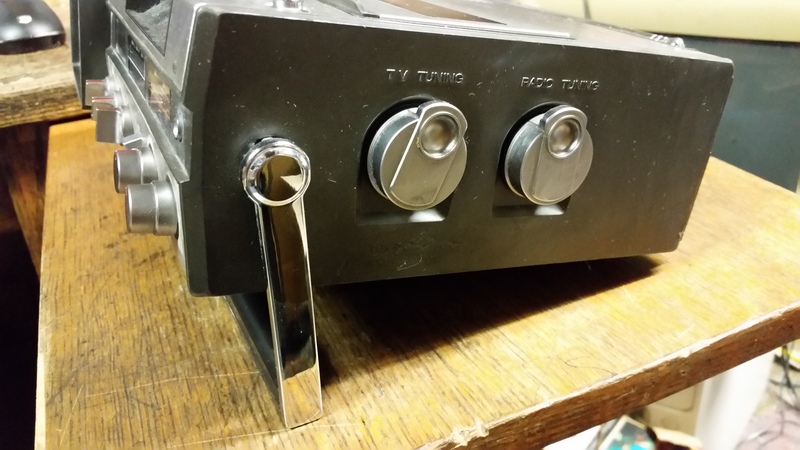 On the right side: the TV and radio tuning knobs, which, obviously, do just as you would expect them to. Really, what else can I say about them? They’re how you change the channels, man! On the left side: inputs for a remote microphone and DC adapter. Since this isn’t just a cassette player but also a cassette recorder, the option for a mic is basically a prerequisite. As for the DC adapter, this TV didn’t come with one, and while I briefly considered finding a replacement, either here or abroad, the memories of the time I fried an Atari jaguar eventually had me deciding against it. In lieu of tempting fate by plugging in a non-official Sony FX-412 adapter, I opted for the required six big giant D batteries when it came to testing. 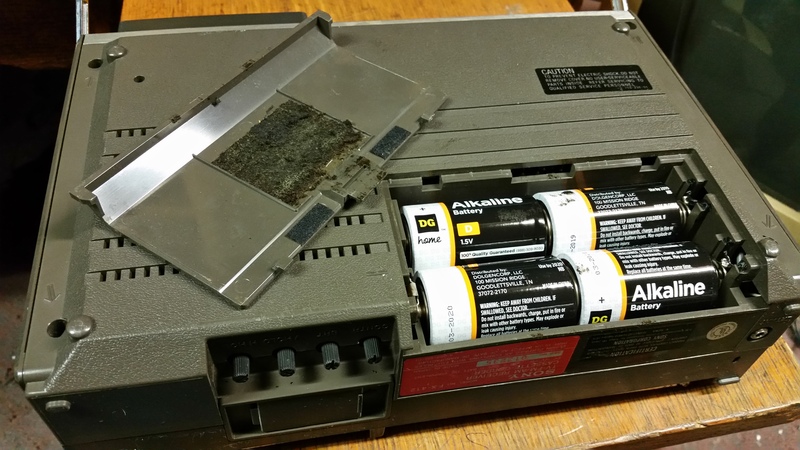 Pleasant surprise: the battery compartment was very clean, which, when it comes to things like this, isn’t always the case. Indeed, only the gooey, steadily shredding adhesive on the inside of the battery compartment-door marred the otherwise clean appearance of the space. Heck, that ain’t nothin’. I have no idea what the battery life of the FX-412 is, but prior experience with portable TVs tells me it’s probably a battery-sucker. I’ve related this story before, but years ago, I took my portable Bentley TV with me camping. As I recall, it had brand-new batteries in it, and the only time I really used it was to watch Terminator 2 on Big Chuck & Lil’ John. By the end of the broadcast, the batteries were so drained that sound was non-existent. So, what, three hours of life, maybe? Granted, that was a cheap Bentley TV that they used to give out free with RVs and such. This TV, however, is a heavy-duty Sony. I really wouldn’t be surprised if it had significantly better battery life. Or not, I don’t know. While being in reasonably good shape for something 36 years old, the broken antenna and AFC switch left me just a bit apprehensive. But as it turned out, the TV and radio both work fine. 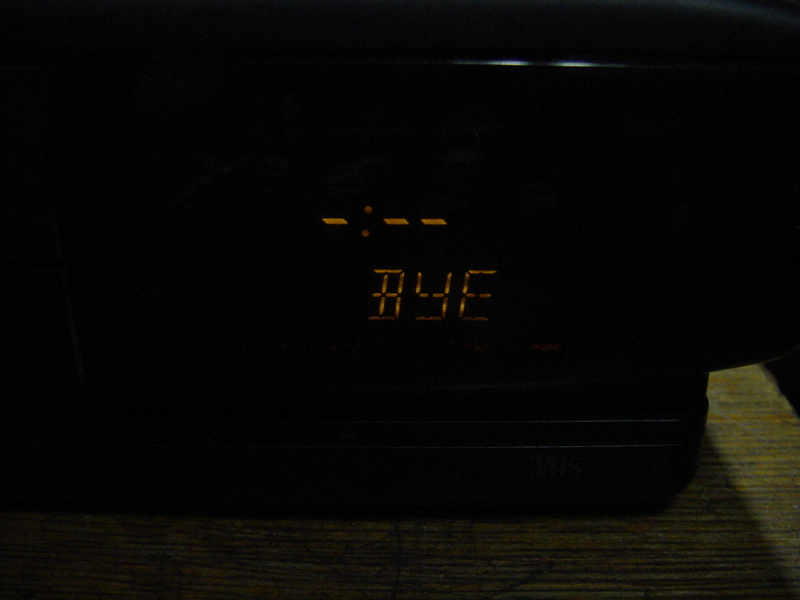 The functionality of the radio is a given, though of course I’m not pulling in any actual channels on the TV portion; since the option for an external antenna is there, and I have indeed seen people (online) get life out of older TVs such as this here in the digital age. I’m not going to go that far, because honestly, it’s not like I’d be using this thing all that often even if everything wasn’t digital nowadays. But it’s sure nice to know that I could. Honestly, the only real doubts I had for the unit were as to whether the cassette player would work or not. Of the many, many TVs and radios I’ve garnered over the years, the vast majority have worked just fine. Cassette players though, those can be kinda spotty. Age, moving parts, and audio heads (that may or may not be shot), they don’t always work together harmoniously here in 2015. 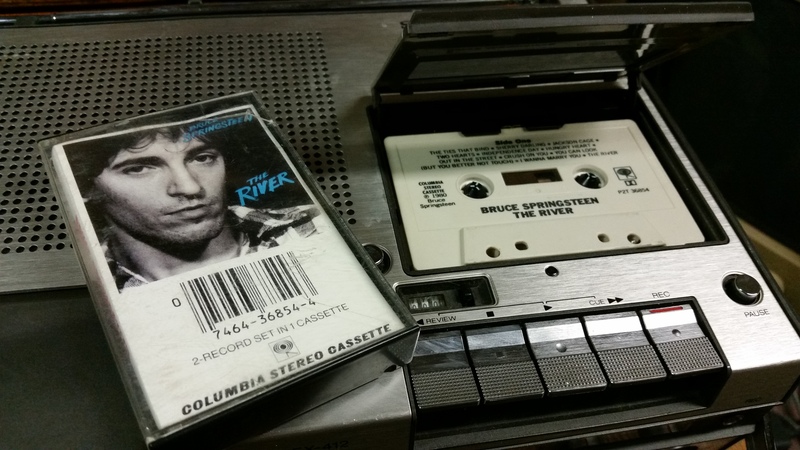 Believe it or not, the cassette player also works! Once again, Bruce fails to, erm, fail me. It sounds a little (just a little) wobbly, but at 36 years old (and being a portable machine to boot), I didn’t expect hi-fidelity anyway. I could easily listen to the whole album on this thing and be satisfied (and who knows when the cassette player was last actually run; a little playtime may be all it needs to get itself back in shape). I can’t tell you how much I love the fact the FX-412 actually has an audio meter, and it also still works. 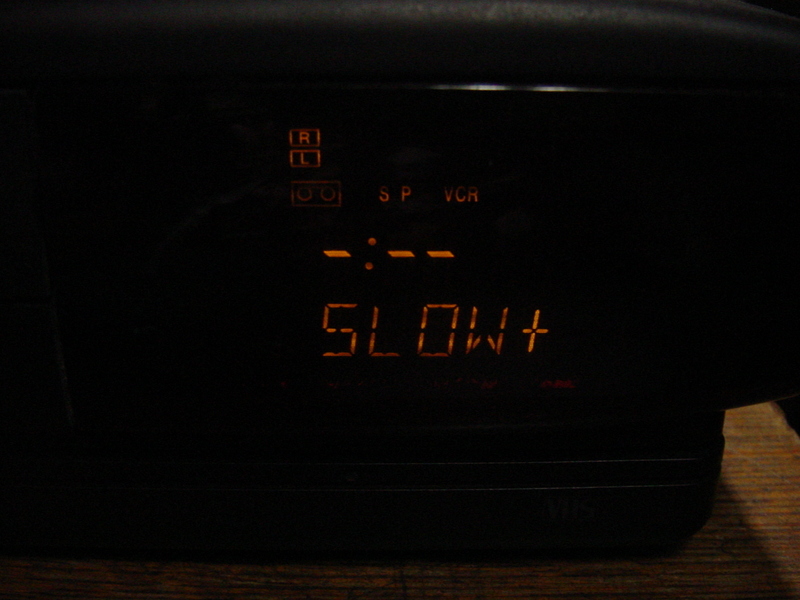 I tried to get a picture of the meter in action to demonstrate that the cassette was indeed playing. You shoulda seen the lil’ guy jumpin’ around to “The Ties That Bind,” fella was groovin’! Just for fun: here’s the FX-412 next to the 1989 Mega Watchman I mentioned at the start of this post. The Watchman is bulky in its own special way, though it lacks the capability of playing/recording cassettes. Aside from the same manufacturer and same portable-entertainment-center-motif, there’s not a whole lot all that’s comparable between the two. But, it is interesting (to me, at least) to see how far Sony progressed in the 10 years since the FX-412 was released. Granted, this Watchman was just one in a whole line of similar TVs, so what am I even going on about again? I like portable Sony TVs, is what I’m trying to say. This is one of coolest electronics finds I’ve had in quite awhile. Besides being a sucker for portable TVs in general, I have a strong affinity for Sony products. So yeah, this is a winner. There’s a few imperfections, sure, and it’s more of a display piece than anything for me, but for only $3, I’ll happily add it to my collection. The Sony FX-412 is shining example of just why I keep such regular tabs on my local ‘haunts.’ Finds like this don’t come everyday, but when they do, they certainly make the “dry” trips worth the return visits. This entry was posted in Uncategorized and tagged 1978, 1979, cassette player, cassette recorder, cassette-corder, cassettecorder, electronic, electronics, fx-412, fx412, mega watchman, old, overview, portable, portable cassette, portable radio, portable tv, review, son walkman, Sony, sony am, sony am/fm radio, sony fm, sony fm am, sony fx-412, sony fx412, sony portable, sony portable radio, sony portable tv, sony tv radio cassette, sony watchman, vintage, vintage portable, walkman, watchman on September 5, 2015 by neovideohunter. 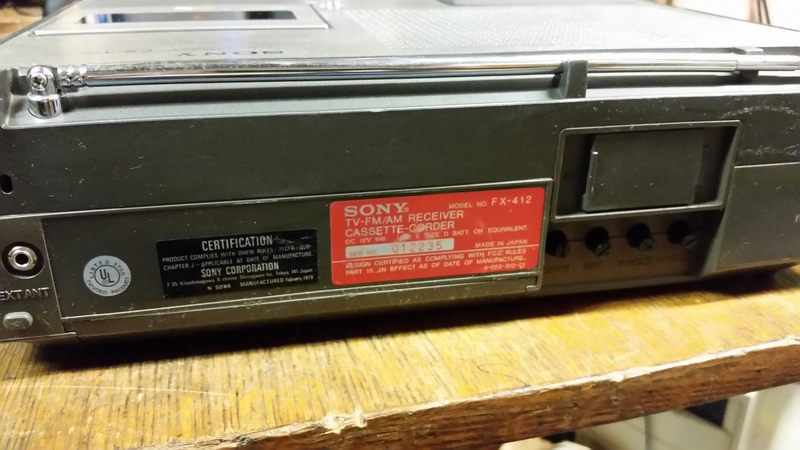 Hey, remember when I used to write about interesting VCRs and whatnot that I had come across? It’s sure been awhile! The reason being that while I have picked up several really good ones in recent months, I just couldn’t get sufficiently fired up enough to write about them. That changes now, because after a fairly long dry spell, I finally, finally came across a ridiculously cool VCR out in the wild that absolutely needs a place of honor (ha!) on my silly blog. 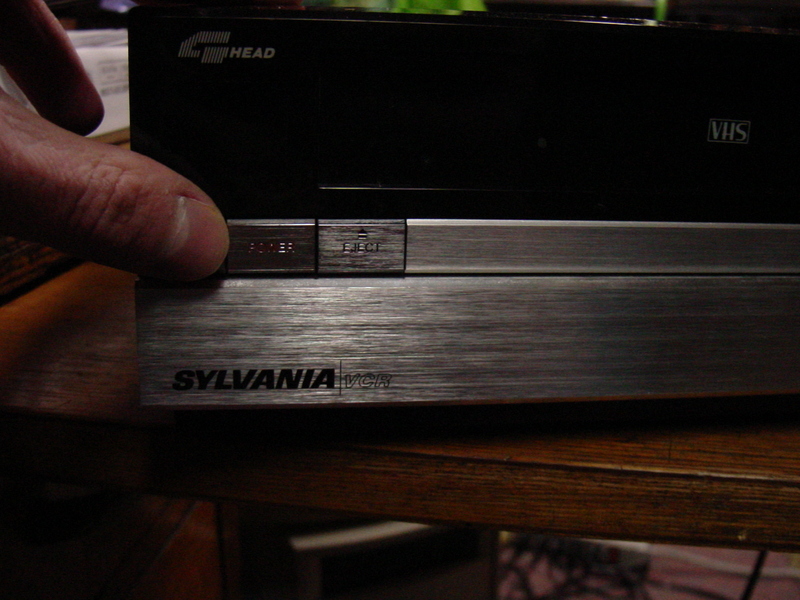 Behold: a Sylvania Hi-Fi VHS VCR, model number VC3645GY01, from 1985! And it only set me back $5 last weekend! Cool winnins! From the picture above, it may not look that interesting. 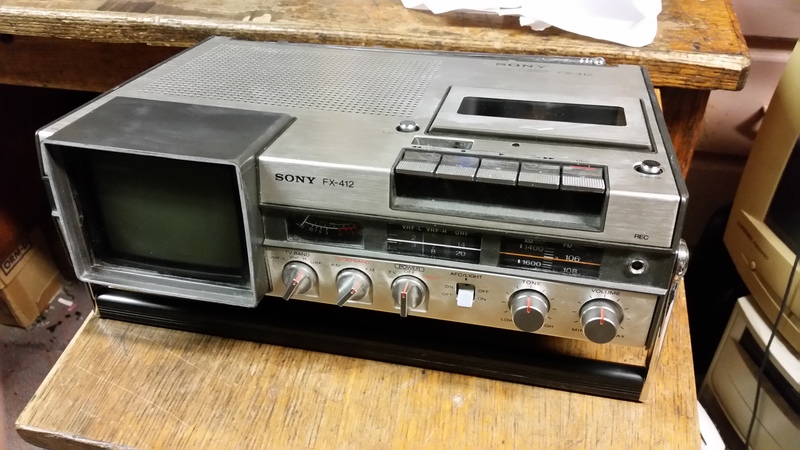 I mean, sure, it has that classy black and silver, heavy duty 1980s design going for it, and it’s a 4-head, Hi-Fi stereo model, but is that really enough to get me to write about it? Plenty of other VCRs from the time period had the same characteristics, after all. Keep reading chief, you’ll see, the real horsepower of this beast is under the hood, so to speak. Outside appearances belie the advantages of this deck, because this thing is positively loaded with features. It all comes courtesy of an everlastingly cool fold-down door. Nope, a regular pull-down door just won’t do for the Sylvania; by pressing the appropriately-named “door” button, all the features drop down to your fingertips. Just look at ’em all! Besides the standard play-stop-rewind-fast-forward-pause-record options, you’ve got the ability to record in all three speeds, and even cooler, the ability to do freakin’ audio dubbing! You can adjust the audio levels, and/or fiddle around with the audio level meter display. I love the old-school tracking control knob, and even though I’ll never actually use it, the (relatively) easy-set clock/timer feature had to have been a blessing back in ’85. And look at that! Even more features! 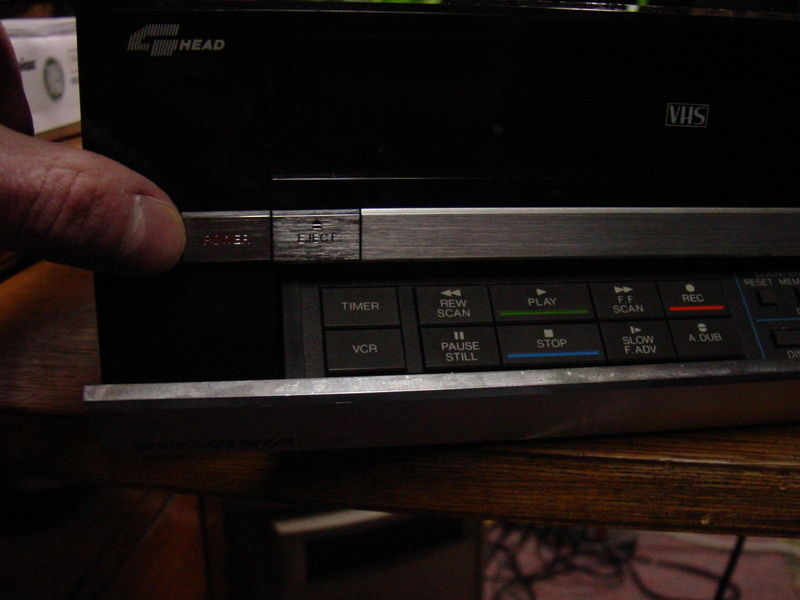 Sharpness control (which is a feature I absolutely love on a lot of these old VCRs), a regular TV or cable TV swich, you can even select normal or thin tape! Since I never really do any audio dubbing, I’m guessing that option was for that particular feature of the VCR? 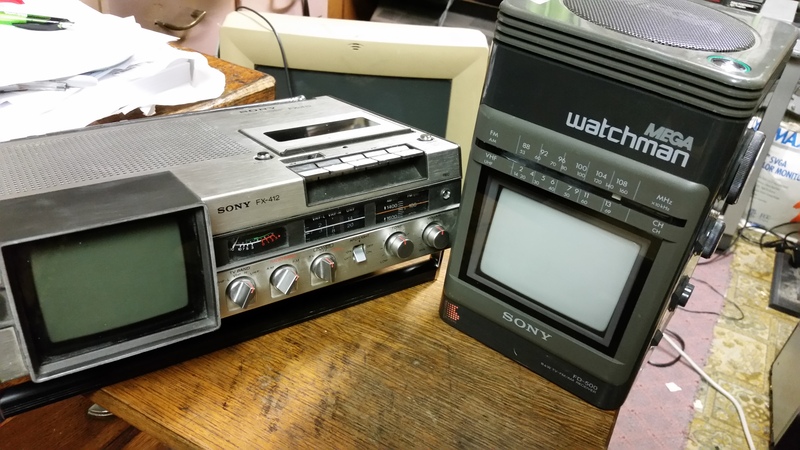 Something that’s really cool and which I wasn’t expecting at all is seen in the left picture above: That 1:37 isn’t the tape counter (indeed, this unit uses the old-school, 0000 tape counters, as opposed to the exact hours/minutes/seconds counters of later VCRs). 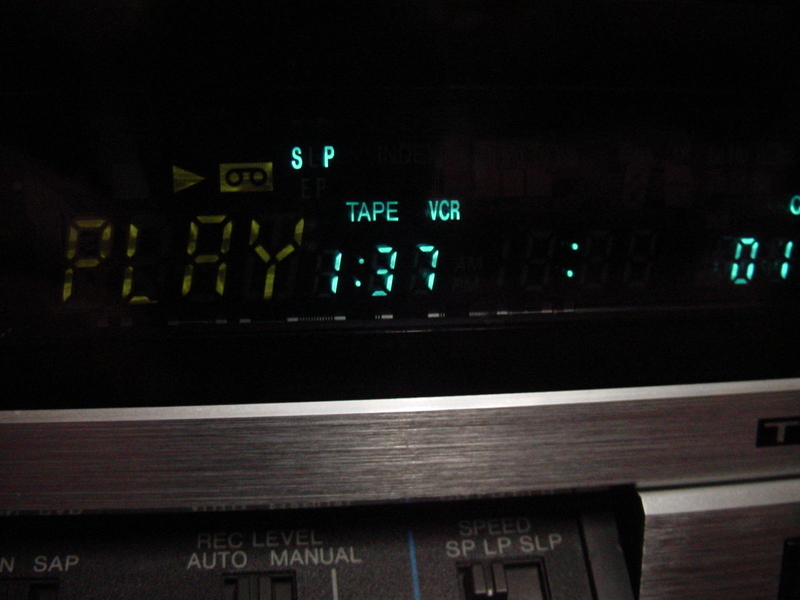 Rather, that seems to indicate how much time is left on the tape. Swanky! That sort of thing was in vogue later on, but I was a surprised to see it used in a 1985 model. The picture on the right demonstrates the slow-motion feature in action. You know, I’ve got that option on a lot of my VCRs (both VHS and Beta), and while it’s not something I ever really use at all, I still get a kick out of it being included. Go figure. And as if all that wasn’t enough, it’s even got an LED audio level meter, in an attractive red-and-blue color scheme to boot! However, there are some sad failins afoot with this deck: it doesn’t quite work correctly. It seems like until it gets “warmed up,” it won’t really run a tape all that well, and when it finally does get warmed up, you get sound (really terrific sound, in fact), but no picture. Maybe the heads are shot, maybe they just need a good cleaning, I don’t know. I’m actually not too upset about this factor, though. The genuine coolness of this VCR was easily worth the $5 I plunked down for it, and besides, odds are it can be repaired in the future, if need be. And yet more features on the back of the unit! You’ll probably have to click on either pic to enlarge them enough to see, but there’s an audio filter switch, camera remote input, right and left microphone inputs, and what really kinda surprised me, a Pay-TV knob. 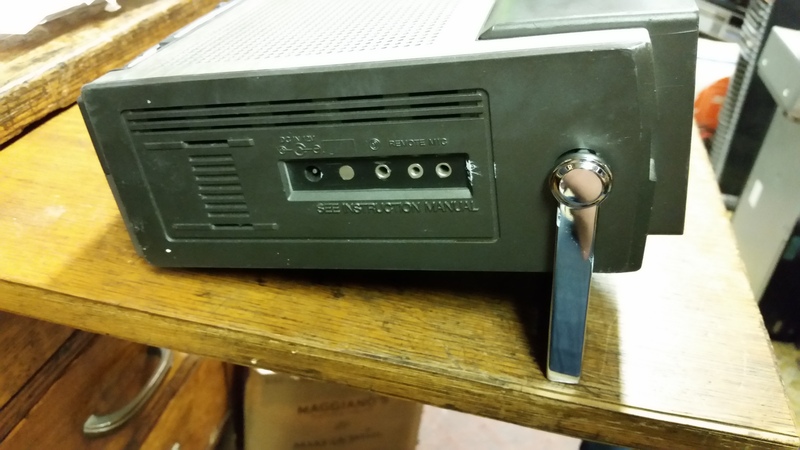 I’ve got a lot of old VCRs lying around, and while there may very well be a similar knob on one of those as well, I just can’t recall seeing a Pay-TV knob on any of them. And truth be told, I’m really not sure how exactly that would work. I’m guessing to record Pay-Per-View and whatnot? Or maybe used in conjunction with those old ‘special channel’ boxes? I have no idea. And that’s all in addition to the necessary stereo RCA jack inputs and outputs. See, model number VC3645GY01, manufactured in late-1985. Did you think I was lying? I wasn’t. I can’t even begin to guess how much this model cost back in 1985, and internet searches really aren’t revealing a whole lot of info about it or even any pictures of it, but this sure looks like it was a pretty high-end model back in the day, and high-end models weren’t exactly cheap at the time. It’s funny, a VCR that was undoubtedly several hundred dollars (at least!) back in the 1980s only cost me $5 last week, but hey, that’s the nature of electronics; it doesn’t take long for them to become obsolete. Well, obsolete to the general public, anyway. Me? I get fired up finding things like this just as much as I probably would have had I found it new in the stores back in ’85! It’s not quite the best VCR I’ve found while out thrifting, but it’s up there, even if it’s not working correctly at the moment. No matter, because I was thrilled to come across this unit. Indeed, I wish I had more finds like it! It’s a welcome addition to my ever-growing mountain of ancient VCRs. This entry was posted in Uncategorized and tagged 1980s electronics, 1980s vcr, 1985, 1985 VC3645GY01, article, electronic, electronics, hi-fi, hifi, high end vcr, old, overview, Panasonic, panasonic re-badge, panasonic rebadge, re-badged, rebadged, review, stereo, sylvania, sylvania hi-fi stereo vhs vcr, sylvania VC3645GY01, sylvania vcr, sylvania vcr 1985, sylvania vhs, sylvania vhs vcr, VC3645GY01 model VC3645GY01, vcr, vhs, vintage, vintage vcr on March 28, 2015 by neovideohunter.